VANCOUVER, July 9, 2018 /CNW/ - NexGen Energy Ltd. ("NexGen" or the "Company") (TSX:NXE, NYSE MKT:NXE) is pleased to report assay results for all fifty-four holes from our recently concluded winter drilling program on our 100% owned, Rook I property, in the Athabasca Basin, Saskatchewan. 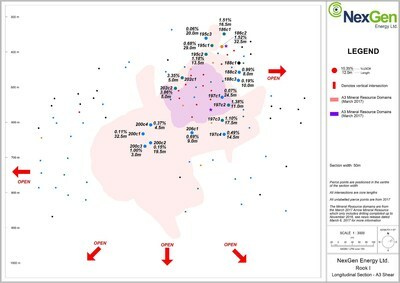 Assays have confirmed uranium mineralization was intersected in areas representing significant step outs to the northeast and northwest of the Arrow Deposit representing large, wide-open areas of potential mineralization growth. Additionally, uranium mineralization was intersected in both A1 and A2 Inferred expansion areas. Further, the A3 high-grade domain infill program, designed to convert Inferred Mineral Resources into the Indicated category proved successful. AR-18-187c3 intersected 2.5 m at 0.47% U3O8 (546.0 to 548.5 m) and 8.5 m at 0.21% U3O8 (596.5 to 605.0 m), 95 m outside of the 2017 RPA Mineral Resource Estimate. This hole is approximately 40 m along strike to the southwest of GAR-17-001 (1.43% U3O8 over 8.0 m). To date, neither hole has been included in the Arrow mineral resource. AR-18-208c1 intersected 0.5 m at 0.60% U3O8 (637.5 to 638.0 m) and 3.0 m at 0.35% U3O8 (686.0 to 689.0 m), 175 m outside of the 2017 RPA Mineral Resource Estimate. AR-18-189c4 intersected 7.0 m at 1.78% U3O8 (819.0 to 826.0 m) including 2.0 m at 5.86% U3O8 (822.5 to 824.5 m) and 36.5 m at 0.56% U3O8 (832.0 to 868.5 m), 215 m outside of the 2017 RPA Mineral Resource Estimate. This hole is approximately 35 m along strike to the northeast of AR-15-050 (0.47% U3O8 over 19.5 m). AR-18-187c3, AR-18-208c1 and AR-18-189c4 represent significant step-outs from the 2017 resource shells and are new areas of mineralization requiring more drilling to define mineralization. 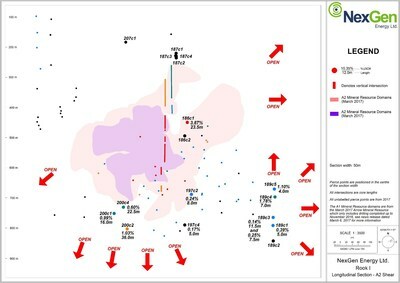 Expansion drilling in the A2 shear was focussed on Inferred resource growth, successfully intersecting uranium mineralization along strike to the northeast of the Arrow Deposit and down dip from the A2 high-grade domain. AR-18-186c1 intersected 23.5 m at 3.87% U3O8 (530.0 to 553.5 m) including 6.5 m at 8.36% U3O8 (532.5 to 539.0 m), 60 m along strike to the northeast of the 2017 RPA Mineral Resource Estimate high-grade domain. This hole is approximately 45 m along strike to the northeast of AR-16-102c2 (0.48% U3O8 over 9.5 m). AR-18-200c2 intersected 36.0 m at 1.03% U3O8 (739.0 to 775.0 m) including 14.0 m at 2.37% U3O8 (532.5 to 539.0 m) 80 m down-dip from the 2017 RPA Mineral Resource Estimate high-grade domain. In addition, AR-18-200c1 intersected 16.0 m at 0.99% U3O8 (743.5 to 759.5 m) 50 m up-dip and southwest of AR-18-200c2. These results in the A2 Shear Expansion represent significant step-outs from the 2017 resource shells and are new areas of mineralization requiring more drilling to define mineralization. The following results from the A3 high-grade domain drilling all contributed to converting Inferred to Indicated Mineral Resources. Indicated Mineral Resources will form the basis of the Pre-Feasibility Study scheduled for Q3/early Q4 2018 release. AR-18-186c2 intersected 32.5 m at 1.52% U3O8 (455.5 to 488.0 m) including 2.0 m at 18.65% U3O8 (462.0 to 464.0 m). This hole also represents a successful expansion of the A3 high-grade domain. AR-18-197c3 intersected 17.5 m at 1.10% U3O8 (638.0 to 655.5 m) including, 4.0 m at 2.57% U3O8 (642.5 to 646.5 m). This hole represents a successful infill intersection at 25.0 m spacing in the A3 domain. AR-18-202c1 intersected 11.5 m at 1.0% U3O8 (512.0 to 523.5 m) and 5.0 m at 3.35% U3O8 (532.0 to 537.0 m). This hole represents a successful infill intersection at 25.0 m spacing in the A3 high-grade domain. Drill hole locations and long sections are shown in Figures 1 to 4. Drill hole assay results are displayed in Tables 1 and 2. The Company has cash on hand of approximately $145 million. Troy Boisjoli, Vice-President, Operations and Project Development, commented: "All U3O8 assays from the winter 2018 drill program have been returned and confirm the discovery of uranium mineralization both in the A0 shear zone, and the area 160 m northwest of the A0 shear zone. Additionally, confirmation of uranium mineralization intersected to the northeast of the A1 and A2 shear zones with the AR-18-189 series holes continues to expand the footprint of the Arrow Deposit. All of these potential news zones - A0, 160 m northwest and northeast strike extensions require additional drilling which is a focus of the current summer drilling program. The continued success of resource expansion and near Arrow exploration drilling, from my experience, indicates the absolute scale of the Arrow Deposit will not be fully realized without significantly more drilling. 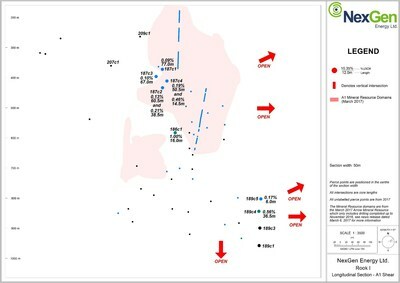 Furthermore, the infill drilling results highlight the strong continuity across the Arrow Deposit as well as the robustness of the Arrow Mineral Resource model, from which the Indicated Mineral Resources will form the basis of the Pre-Feasibility Study. The team is looking forward to following up on results from the Winter 2018 program, while in parallel advancing key project development initiatives. Leigh Curyer, Chief Executive Officer, commented: "The 2018 winter drill program was a shift in direction predominantly designed to boldly test the outer footprint of Arrow and resulted in the discovery of new areas of uranium mineralization. I congratulate the entire team for their dedication to this initiative. These results indicate significant drilling remains ahead to define these areas and other targets in and around Arrow prior to the ultimate extent of mineralization at Arrow is defined. It is truly a unique situation whereby the size and extent of Arrow is continuing to evolve in parallel to conducting the project studies and initiatives to optimally advance the project towards production." All depths and intervals are metres downhole, true thicknesses are yet to be determined. Resource modelling in conjunction with an updated mineral resource estimate is required before true thicknesses can be determined. 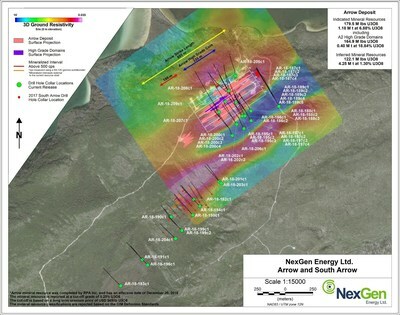 NexGen owns a portfolio of prospective uranium exploration assets in the Athabasca Basin, Saskatchewan, Canada, including a 100% interest in Rook I, location of the Arrow Deposit in February 2014, the Bow discovery in March 2015, the Harpoon discovery in August 2016 and the Arrow South discovery in July 2017. The Arrow deposit's updated mineral resource estimate with an effective date of December 20, 2016 was released in March 2017, and comprised 179.5 M lbs U3O8 contained in 1.18 M tonnes grading 6.88% U3O8 in the Indicated Mineral Resource category and an additional 122.1 M lbs U3O8 contained in 4.25 M tonnes grading 1.30% U3O8 in the Inferred Mineral Resource category. All scientific and technical information in this news release has been prepared by or reviewed and approved by Mr. Troy Boisjoli, Geoscientist Licensee, Vice President – Operations & Project Development for NexGen. Mr. Boisjoli is a qualified person for the purposes of National Instrument 43-101 Standards of Disclosure for Mineral Projects ("NI 43-101"), and has verified the sampling, analytical, and test data underlying the information or opinions contained herein by reviewing original data certificates and monitoring all of the data collection protocols. For details of the Rook I Project including the quality assurance program and quality control measures applied and key assumptions, parameters and methods used to estimate the mineral resource please refer to the technical report entitled "Technical Report on the Preliminary Economic Assessment of the Arrow Deposit, Rook 1 Property, Province of Saskatchewan, Canada" dated effective September 1, 2017 (the "Rook 1 Technical Report") prepared by Jason J. Cox, David M. Robson, Mark B. Mathisen, David A. Ross, Val Coetzee and Mark Wittrup, each of whom is a "qualified person" under NI 43-101. The Rook I Technical Report is available for review under the Company's profile on SEDAR at www.sedar.com. U.S. investors are advised that while the terms "indicated resources" and "inferred resources" are recognized and required by Canadian regulations, the U.S. Securities and Exchange Commission does not recognize these terms. U.S. investors are cautioned not to assume that any part or all of the material in these categories will ever be converted into mineral reserves.